Please note: if you have Plex support already enabled "the old way" (using the shared plex server), you need to disable it first (your media will remain untouched) and then refresh your seedbox details page, in order to see the Plex as a dedicated application in the "Installable applications" list. 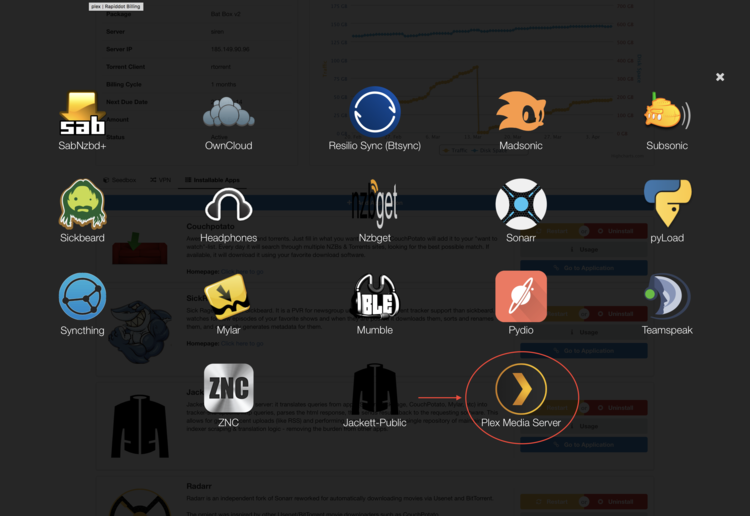 The Plex Media Server is a closed source project, that is intended as a home media center, in order to stream your personal library. 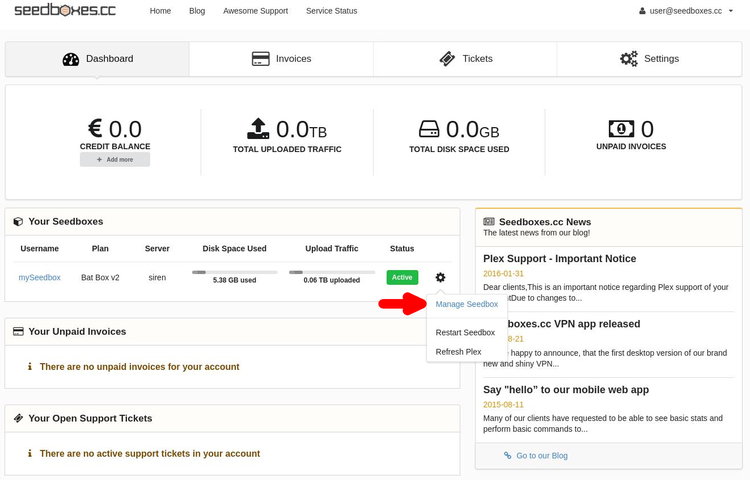 We support a dedicated plex server installation, meaning you will have administration access over your own plex server, and be able to change its settings at will. First you need to create a Plex.tv account if you already do not have one. It is free to create one. Under "My Seedboxes" click on the little gear icon next to the seedbox you want to use and click on the "Manage Seedbox" button. Scroll down and Click on the Installable Apps Tab. Click on "Add Application".From the application list, click on "Plex Media Server", then click INSTALL. A popup emerges, which asks your CLAIM CODE. This is a code, which can be retrieved from here. This code, will link the newly installed Plex Media Server with your Plex.tv username. This code expires 5 minutes after it is generated, so please make sure to use it immediately after it is generated and proceed with the Plex server installation. Once you click INSTALL, the installation will commence and you will be informed once it is completed. Once Plex is installed, you can click the "Go to Application" button to visit your new plex installation. Alternatively, you can go to https://plex.tv and after you login, to click the "Launch" Button on the top right corner of the screen. Please login with your Plex.tv account. Please be careful not to use your seedboxes.cc account to login, you need to use the credentials of your Plex.tv account instead. The setup is now completed. Our automated installer should have created 3 default libraries for you (Movies, TV and Music). You can create as many other libraries as you want of course. IMPORTANT: To stream your media files you will need to move your media files inside the appropriate Plex directory! Please try to avoid to point your ~/files/downloads folder as your Movies and TV path in your libraries. If you do this, your plex server will underperform during scanning of new media, will make many wrong matches, and potential crash often. If you do not want to continue seeding the files you can easily move them via the File Manager which your ruTorrent provides (look at the tabs at the bottom). If you are not using ruTorrent as your torrent client, then the only alternative is to use an FTP client (such as FileZilla) and move the files you want in the appropriate Plex directories. Hi just brought a Nvidia Shield pro, can i strem from that to my seedbox via Plex? :? I have noticed the past couple days that my Movies arent updating/refreshing in plex as fast as before. I waited about an hour before I gave up and noticed it had updated in the morning. I have not had an issue with this until now. I restart the seed box and refresh plex libraries, any ideas. I was also curious about the update. I too am curious how we can update the media server. The new Plex does not update/refresh as fast as before. It sometimes takes up to 24 hours before the files in my seedbox show up in my plex library. I have not had an issue with this until after the update :-( . Any idea on how do we update the Plex to the latest version? *Plex is the only application that does not update automatically. We need to test each new version (in order to make sure that no bugs have been introduced with the new version) and then we deploy the update to all clients. Unfortunately it is very common new plex version to break things and perform much worse than previous versions. For anyone having trouble with Plex updating your new content you will need to do a couple of things to get the content to show up immediately. Check the first box "Update my library automatically"
On your home page click the 3 dot menu next to the library you want to update (movie, music, tv, etc) and select "scan library files"
You can use both of these workflows together or separate depending on your needs. I personally use both. When I want to watch something right away is when I will use option 2. most of the time though option 1 will give you your content within a 5 minute window. does plex pluggin support https? Could you please explain? Is the best practice for moving media into the appropriate Plex directory to do so manually every time that a download completes? This was a great installation guide. The only thing missing is actually how to use the seedbox with Flex. I had never used flex. So I did not know what to do with it. It was later after I had clicked on the top left hand corner under the home icon and selected remote that it all started to make sense to me. b4 seeing that, I was doing all kinds of google searches to try to figure it out bc it was not obvious what the next step to do was. Hopefully this will help someone else as well. IMPORTANT: To stream your media files you will need to move your media files inside the appropriate Plex directory! Please try to avoid to point your ~/files/downloads folder as your Movies and TV path in your libraries. Will the file still seed after it is moved to the Movies or TV folder?